I ran 1-17 the brass monkey but to be honest I didn’t enjoy it at all – it’s certainly a fast course but like I said in my last post I’m not feeling it for road running at the minute and I’d have rather spent the time in the fells. My results from my x-ray and ecg scan both came back ok – next step is a test to see if I’ve got Athsma. Moving on I had an amazing weekend in the lakes with around 30 other current/former hoops. Travelled over on the Friday morning and Satch dropped me off at keswick. From there I ran over catbells, maiden moor, high spy and then climbed up to dale head where everyone else was ascending from honister to run leg 3. The clag was down by the time I was at maiden moor so I had no idea how far away I was away from everyone – I had arranged with Peter beforehand to text each other when we got to dale head but it wasn’t until I got to high snab that I got a message from Will to say they had reached dale head at midday. I caught up with everyone at portinscale and we ran into keswick together – 19.5 miles and almost 5000ft of ascent in the bag. The plan for the next day was reccie of leg 3, or at least as far as we could get. The night before a lot of people were asking how far we were going to be running. My estimation was somewhere between 16-20 miles but I prefer to think of fell runs in terms of time rather than distance. Running 16 miles in the fells is very different from running 16 miles on the road- in some ways it’s easier but in other it’s harder. The intensity is easier – you aren’t worried about maintaining a pace, you are running at a slower pace and on a training run if that distance you will probably stop for food which will also be easier to digest (proper food too, not gels). What makes it harder is predominantly the terrain and weather. Obviously there is a lot more ascent/descent involved and even if the terrain is relatively flat it can be very energy sapping if your body isn’t conditioned for it. It’s something I’ve always struggled with and I believe more than ever now that it’s lack of fell training. It stands to reason – for any race/event you want to do you need to make sure your training is specific to that event. There’s no point doing speed work on the track if you’re training for a 100 mile hilly ultra. It can also be more mentally challengig, especially if the weather is bad -luckily the weather was kind to us, but I’m going to cover this and navigation in another post. In the end we did around 17 miles, making it as far as bowfell in glorious conditions. Both nights after the runs were fantastic but the 2nd was particularly special as after the singer finished his act John Finnighan stepped up to that mark and kicked off an impromptu singing session. 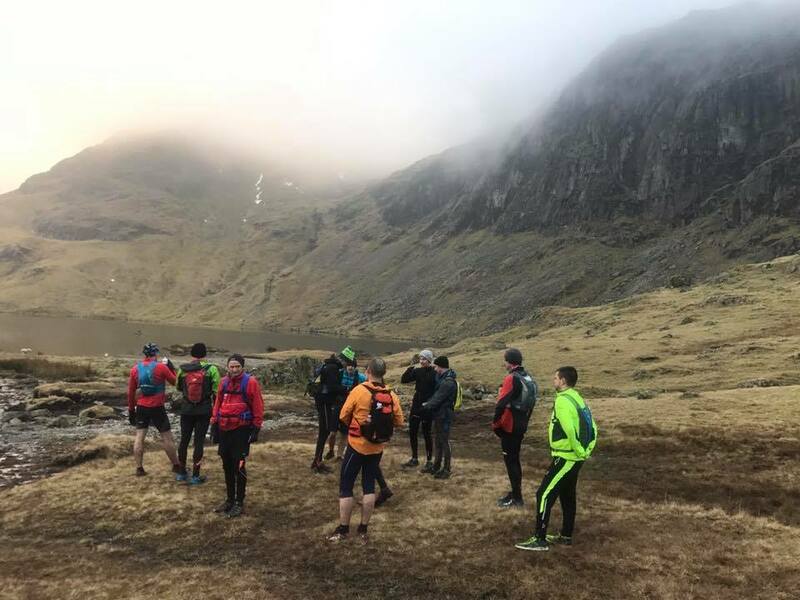 The 3rd day involved harra conning everyone into thinking they were going for an easy run round the lake but turned out into a run up loughrigg fell (which normally would have great views but they were restricted because of the clag). To be honest that worked out better for me but I’m not sure everyone agreed, especially John longstaff who had to have a sick break half way up 🙂 . Another plus I got out of the weekend was catching up with Chris, Keith, Phil , John and Jonny who have all made BGR attempts and picking their brains. I got some great tips – one thing I was (pleasantly) surprised with was the amount of training they had done for their rounds – I thought it would have been more. Its something I’ve struggled to get my head around – you don’t find many bob graham rounds training plans in runners world. I know I need to get into the fells as much as possible how how much and how often? It’s a fine line and it brings me to my next point – overtraining. When I got back from that weekend I felt fantastic – went out on Monday and my legs felt as fresh as if I’d done nothing over the weekend. When I got back though I had some pain in the arch of my left foot which made walking uncomfortable. I ran through it until Friday, but by then I was almost hobbling so it was obvious I needed to rest which I have done since. Im hoping its not plantar fasciitis. It’s getting better now so hopefully I can put it behind me but it’s just another reminder that one one hand the human body is amazing and capable of outstanding feats of achievement but on the other hand very fragile and needs to be looked after, especially as you get older.